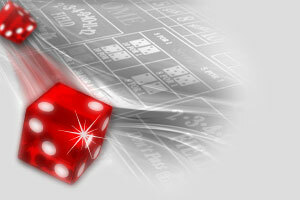 Craps game has several betting options which can confuse a new player; but as soon as you learn all the game's rules, which are rather easy comparatively to other casino games' rules, you will be able play and win in Craps. Pass Line - this is the most common bet, which wins if 11 or 7 is rolled. If it is a 2, 3, 12, the bet loses. And some certain point is established for other numbers being rolled. Don't Pass Line - this bet is the opposite to the previous one. It wins if it is 2 or 3, loses if it is 7 or 11. And if it is 12, it is a push. Come - this one is almost the same as the Pass Line. The exception is that a player can make this bet whenever he/she wants after the establishing of the point. The winning numbers are 7 and 11. Losing - 2, 3, 12. Place - This one is the bet on 4, 5, 6, 8, 9, 10. It is possible to make this bet at any time. The payouts are 9:5, 7:5 and 7:6. Place Bets to Lose - the payouts are 5:11, 5:8, and 4:5. Buy - the options of these bets are same as in the Place Bets. But the pay offs are different: 5:11, 5:8, and 4:5. Lay - the opposite to the previous one. The pay offs are 1:2, 2:3, and 5:6. Field - the winning numbers are 2,3,4,9,10,11. And if the next numbers are 3,4,9,11 a player wins even money. Hardways - there are four types of this bet: 2-2, 3-3, 4-4, 5-5. The losing number is a 7. Any Craps - he winning numbers are 2,3,12. Payoff 7:1. Craps or Aces (Snake Eyes) - The only winning number is a 2. 7:1. Craps or Ace - the only winning number is 3. 15:1.
or Six Five - 15:1. Horn - this bet includes 4 bets. A player can place one bet 2,3,11,12. The payoff is 3.75: 1 with 3 or 11 winning numbers. The payoff is 7.5: 1 with 2 or 12.